15-Dec-2019: Added "®️" to Invisible Fence titles on the Invisible Fence page. 15-Dec-2019: Set email addresses on General Contact and Get Quote forms to eddiefog@gmail.com,ed@pittsburghpetfence.com,info@pittsburghpetfence.com until Ed decides which one(s) to use. 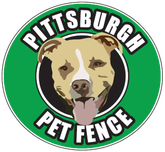 15-Dec-2019: Went live on domain pittsburghdogfence.com. Website crafted by GET WEB, Get Going!